BUDAPEST - A Hungarian artist has a new exhibition depicting political leaders in the style of iconic paintings with the aim of shocking viewers and holding a mirror to current times. Bela Marias, or DrMarias, has been painting politicians for about a decade, and defines it as "social surgery." 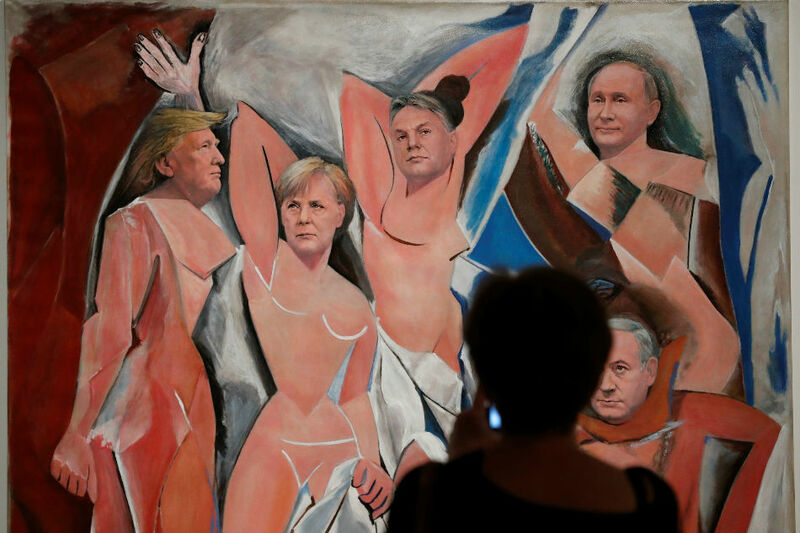 His latest exhibition in Budapest features portraits of Hungarian Prime Minister Viktor Orban as well as German Chancellor Angela Merkel and Russian President Vladimir Putin, among many others. "All my life I wanted to run away from politics but I could not, so at one point I decided to make art of this," the 52-year-old artist said. One of the paintings entitled "The sacred family in Picasso's studio" resembles Pablo Picasso's famous Les Demoiselles d’Avignon. It depicts Orban surrounded by US President Donald Trump, Merkel, Putin, and Israeli Prime Minister Benjamin Netanyahu -- leaders who have all influenced Hungary. Another painting depicting Hungarian-born US billionaire George Soros is entitled "George Soros, the Dark Lord of the World." It mocks the vilification of Soros by nationalists in Hungary. The paintings are on display on a former Ukrainian barge on the Danube. Built in 1968, it had been turned into a boat for parties.